Artist Unplugged: Parties, Parade, Panic? Okay, one of my photos was accidentally deleted while typing (could I already be that rusty?) so you may have to scroll up after you read! Weekend before last we went to a birthday party for my great nephew. 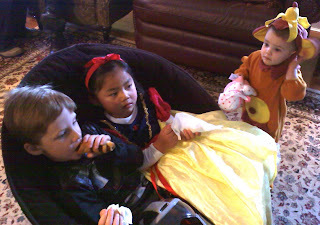 He is in the top photo, Finn, on the left, sitting with his little friend, "Snow White", while Finn's cousin, Stevey, my great niece, the monkey with a banana on her head looks on. Finn's birthday is Dec. 23rd (my mom's too) so they had the kid party earlier. What theme did he want? Halloween! So the party was a "Nightmare Before Christmas" themed party with the children wearing their costumes, Halloween decorations amongst the Christmas decorations! My niece made an awesome cake for the party. 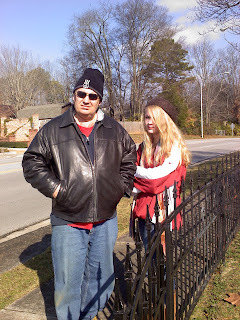 Mr. Unplugged, VolleyGirl and I went to Christmas parade this past Saturday, the first time in many years that we have. 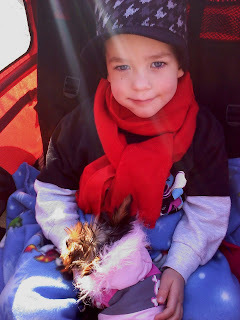 The middle photo is Finn's younger brother, Eli, holding a friend's little yorkie while his mother pushed him in the parade......aren't they both adorable....I know, I am a bit partial! It had snowed a whopping half inch here and was very cold! That's Mr. Unplugged and VolleyGirl in the last photo as they waited for the parade to begin! Quick update....last week was my first week on my new job. It went well, felt really weird since I have not worked regularly, training and such in over 21 years!!!! There were constantly little puffs of dust coming out of my ears as I learned something each day!!!!! It is a wonderful atmosphere, the co-workers are all really wonderful, one of them started the day before I did and she is my best friend. I work Tuesday through Friday this week and should be cleaning and putting up my decorations inside. I washed all weekend and put items out of the way for the decorating. I also worked on my photoshop skills a bit with some of my artwork that was already scanned in. I also worked on the zentangle some last night that is "commisioned"! Just must be very careful about this cleaning and decorating....how many Christmas seasons has my back "went out"? Hmmmm, at least four.....not this year hopefully! Tried to catch up on my commments....I miss reading and posting daily so much!!!!! BigBoy comes in at the end of the week for about a month for the holidays! Yeaaaaaaaaaaaa! I want to have all the decorating complete by then. He and his dad put up the outside decorating over the Thanksgiving weekend....will post photo soon! My goodness you have been a busy girl. Don't panic. It will all get done...and if it doesn't...you didn't need it done in the first place. Cute kids, cute party idea, great fun had by all it seems. Cute kids for sure. YOu sound very busy. Thats great about the Exhibit in the Gallery. Do keep us updated if it comes off. and Those are Alpacas. Thats an Apalca farm we went to. Such cute faces. Thanks for the visit. I know how busy you are. well you are always busy but even more so now. Hope the job gets easier. That's a Yorkie on his lap?? It looks like a bunch of bird feathers! A commissioned Zentangle? Now I've heard it all! glad you're happy at the job - busy times for us all!